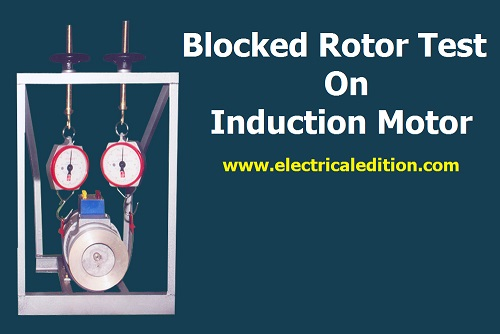 This test is also called as Locked Rotor test or short circuit test.In the previous articles we had discussions on construction of induction motor,working of induction motor.We know induction motor is functionally similar to transformer.Like short circuit test on transformer blocked rotor test on induction motor is conducted. Quick Point: Blocked rotor test on induction motor is to find out stator copper loss, rotor copper loss without friction and windage losses. In this test, the rotor is blocked by a belt-pulley mechanism,so it is not allowed to rotate.So rotor speed will be zero (Nr = 0).So slip (s) =1 and RL' = R2' (1-s)/s is zero.If the induction motor whichever is using for this test is slip ring induction motor then the winding are short circuited at the slip rings. 1.First block the rotor of induction motor by pulley-belt mechanism. 3.Now, slowly increase the voltage in the stator winding so that current reaches to its rated value. At this point, note down the readings of the voltmeter, wattmeter and ammeter to know the values of voltage, power and current. 4.Now the applied voltage Vsc, the input power Wsc and a short circuit current Isc are measured. Now the equivalent circuit is as shown in above figure. X1e = √Z²1e-R²1e = equivalent reactance reffered to stator.